Greetings campers. 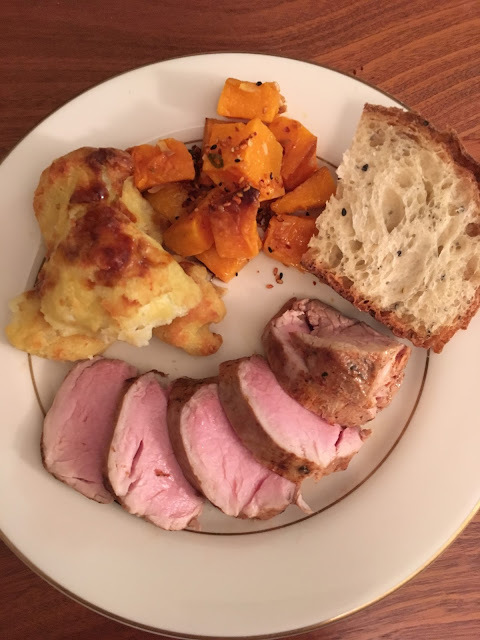 The unpromising shrink-wrapped thing to the left of this text is a sous vide-d pork tenderloin. A little seasoned salt, some olive oil and not much else in there with it. 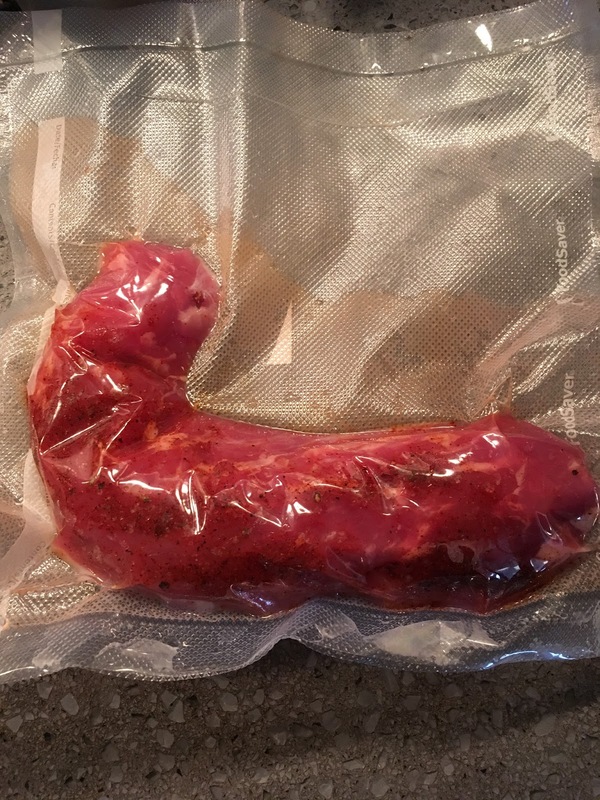 The bend in it is a little weird, I'd be the first to admit, but I don't have super long bags, and I didn't want to cut the raw tenderloin in two. Anyway, as with all things sous vide (and all things pork tenderloin, too), it's not the most exciting thing in the world to watch it cook. But here's a shot of it cooking just the same. 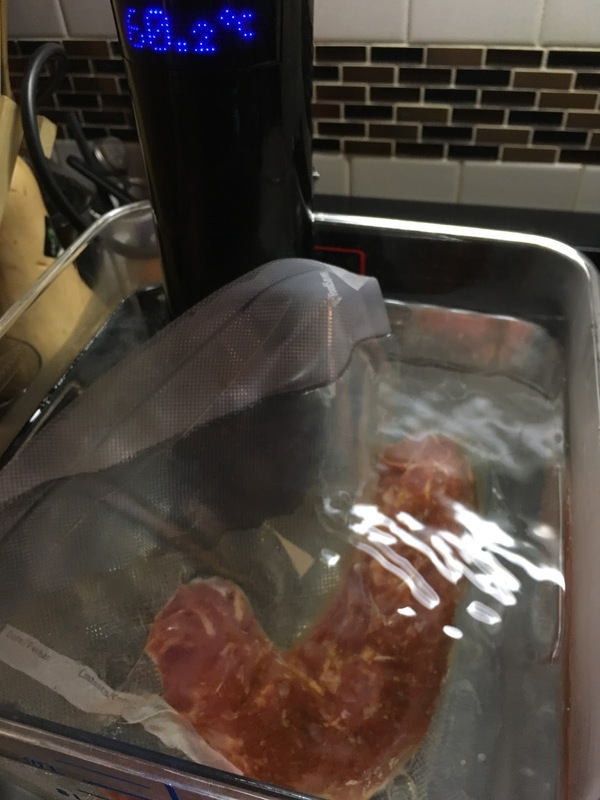 Eagle-eyed readers may note that I'm using Celsius on the immersion circulator. I was feeling European. And below is the finished product. One of the sides is a little roasted butternut squash I made myself, topped with some seasoning mix from Kyoto. The other is some gratineed cauliflower, frozen from Trader Joes. Not bad, though I'm not sure I'll run out and buy more of it. 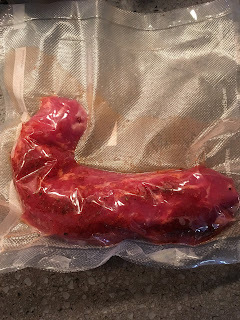 Anyway, of all the things I've cooked in a bath so far, pork tenderloins are second only to chicken breasts as far as this is really the only way you should ever ever cook them. 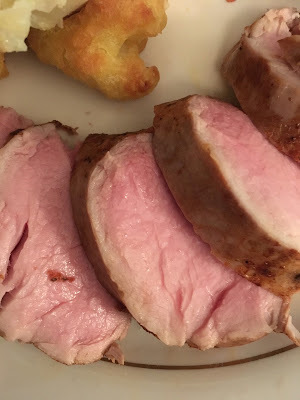 It didn't take a huge long time, the meat came out perfect, and it was quick and easy to get a nice sear going via a quick visit to the skillet. Total and unqualified success. I am really looking forward to making another one of these!